Digital Rights Foundation marked the soft-launch of Pakistan’s first quantitative research study on online violence titled, “Measuring Pakistani Women’s Experiences of Online Violence”. The research is part of Digital Rights Foundation’s ongoing project “Hamara Internet” that aims at raising awareness, training women how to safely use digital spaces, and teaching them how to fight online abuse and tech-related violence. The research study “Measuring Pakistani Women’s Experiences of Online Violence” compiles the data collected from close to 1400 women during the 17 sessions that had been conducted in Punjab, Sindh, KhyberPakhtunkhwa, Balochistan, and Gilgit, to create the first ever set of data around online violence in Pakistan. The study maps different aspects of online violence against women, along with a look at how women use digital tools on the whole. The data collected from the students studying in public and private universities quantified women’s habits online, experiences with harassment, and knowledge of protection measures. The research fills the gap in existing data on online harassment among women in Pakistan. According to the findings of the research, 79% of the respondents use technological devices regularly, 48% of them own smartphones whereas the majority of 67% use Facebook regularly. The study also marks that 72% of the women were not aware of the laws relating to online violence in Pakistan. 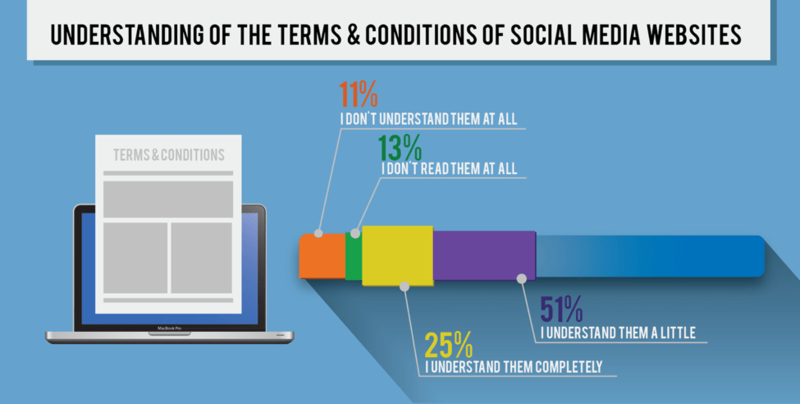 The research also finds that 25% of the respondents were aware of the terms and conditions of social media, whereas 51% said that they don’t understand the terms and conditions completely. Considering that only the fourth of the total number of women surveyed knew and understood the said terms, the situation becomes alarming as a large number of women have joined the social media services without knowing what they’re signing up for. If women do not understand these systems to begin with, they effectively forgo whatever means of protection they could have used that are available at their disposal. When asked about how much information of them exists online, most of the respondents - 35% - agreed that very little information about them exists online while 6% committed that a lot about themis available on the internet. This adds to the already established belief that women prefer anonymity online owing to fear of their own security online and offline. Women were also hesitant to put their information online because of the fear of getting harassed that was established by the responses of 50% women who agreed that they’re mostly prone to online sexual harassment on social media than any other medium. 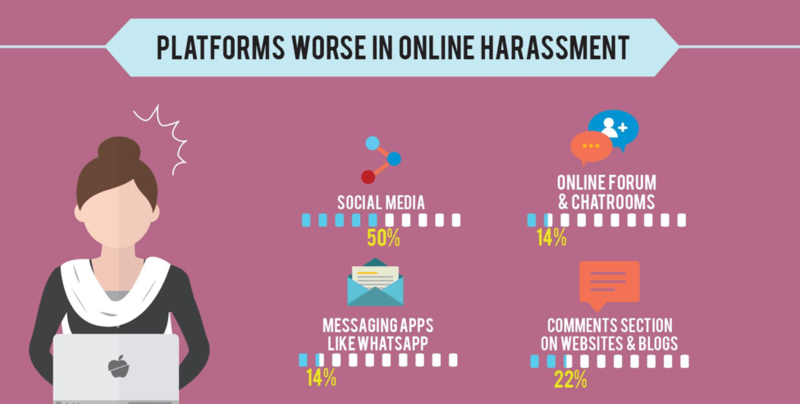 The report reiterates that 40% of the respondents have been harassed or stalked online at some point. 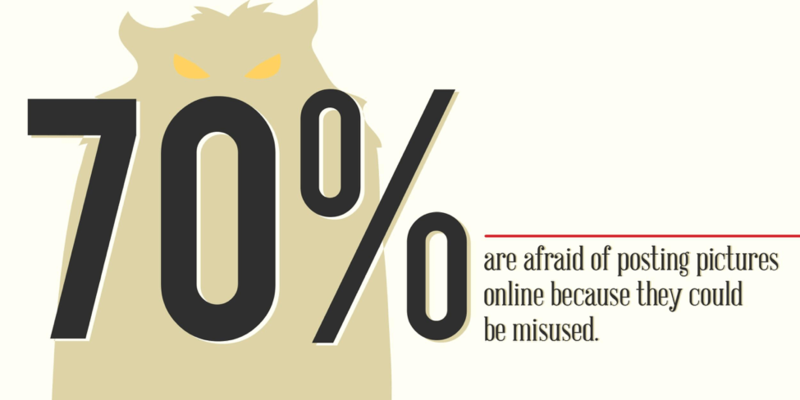 However according to the survey, 70% of the women are afraid of putting up their own photos online because they are afraid of them being misused. 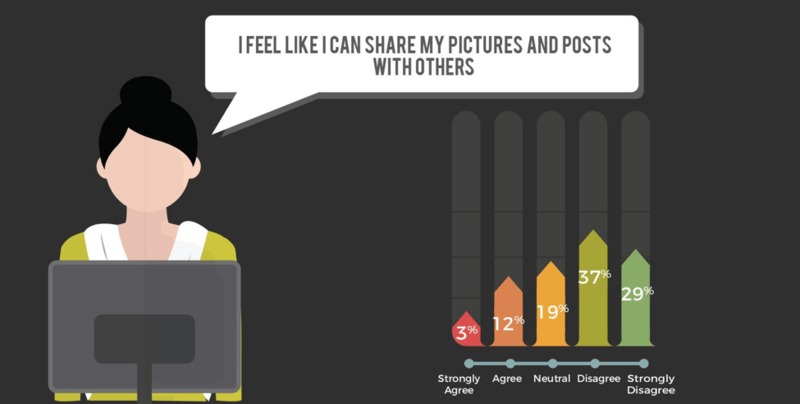 When asked if they’d share their photos and posts with others online, most of the respondents - 37% - disagreed and 29% strongly disagreed. Whereas only 3% said that they’d definitely share their posts and pictures online. Online sexual harassment is multifaceted and every person takes it differently and their experiences vary from each other. For this matter, we asked the participants if they’d report online violence to the law enforcing agencies (LEAs). 39% of the participants said it would tarnish their reputation, and 33% said that it’d cause danger to them. The study also highlighted some positive factors. Like when asked if women who are harassed online should stop using social media, 45% strongly disagreed. 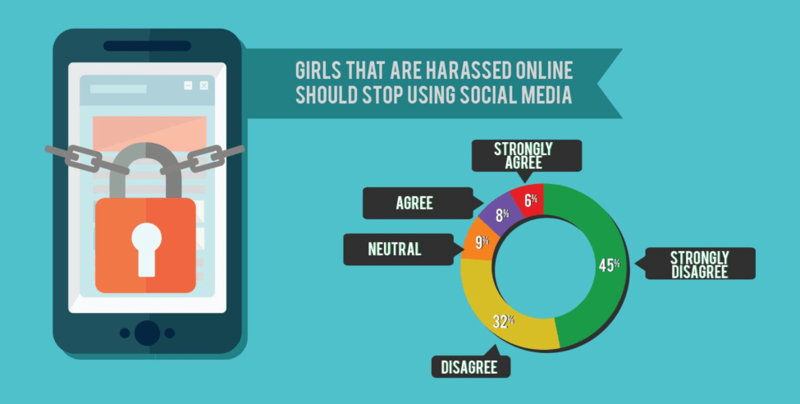 28% strongly disagreed and 30% disagreed with the statement that women who are harassed online are at fault. The objective of the survey was to fill the gap in existing data on online harassment against women and to analyse gendered access to technology. The report also aimed at exploring the experiences of women online and also initiate politicized and informed discussion about gender empowerment within the virtual space. This report will also be used as an advocacy tool for gendered digital rights.